Today British crowdinvestment platform Crowdcube started pitching the crowd to raise 1.2 million GBP. 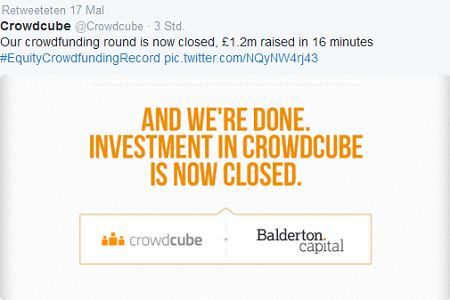 This was on the same terms as the 3.8 million GBP it raises from Balderton Capital in this series B funding. The total raised is for 25.64% equity. This puts the valuation at about 19.5 million GBP. The pitch was funded in a record 16 minutes by 142 investors. There was a minimum investment threshold of 1,000 GBP (and a maximum of 25K GBP) in this round. Crowdcube launched in 2011 and has raised over 30 million GBP for more than 130 start-up, early stage and growth businesses. More than half of this finance has been secured in the first half of 2014. Crowdcube also succeeded to sign up international partners and now has a presence in seven countries: Brazil, Sweden, Dubai, Poland, Italy, Spain and New Zealand. I feel that Crowdcube has done tremendously well in terms of product development and building its market position. This round follows earlier rounds, where Crowdcube raised 320K GBP in Dec. 2011 (I invested a small amount during that round) and 1.5M GBP last year prompting Techcrunch to rightly state ‘Let no one accuse Crowdcube of not eating its own dog food‘. However I would expect a crowdinvestment platform to be a stellar role model in communication with its own investors and I feel there is lots of room for improvement there (especially when compared to some other equity crowdfunding pitches I invested in) as frequence and content of information provided has been sparse and I found the answers to my direct email queries to Crowdcube directors unsatisfying.